What could be more fabulous than taking part in the New Orleans Mardi Gras celebrations that takes place every year in February. 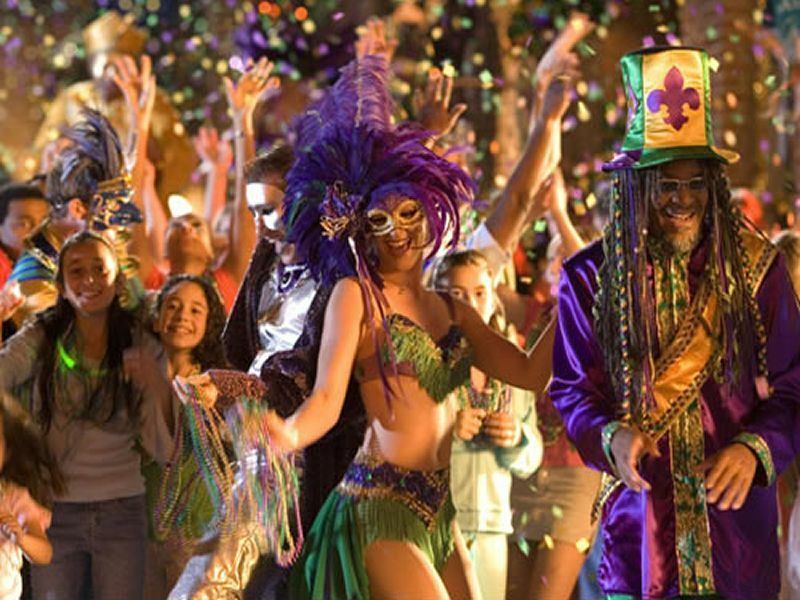 Dress in purple, green and gold, follow the Zulu Krewe and throw a coconut, or try to take part in the parade lead by the legendary Mystick Krewe. See how many babies you can collect at King Cake parties and start a collection of throws. Definitely a holiday of a lifetime – something to add to your own list of things to do before you die. In New Orleans, Mardi Gras or Fat Tuesday is a heady mix of parties, parades and fun that culminates on the Tuesday before Lent. Celebrations begin on the 6th of January at Epiphany, with the Phunny Phorty Phellows Krewe taking their annual street car ride, join in and cheer them on as they ride down St. Charles. Traditionally debutante’s ‘came out’ in New Orleans at this time of year, to coincide with Mardi Gras celebrations. Mardi Gras always means Fat Tuesday in particular, but for the two weeks leading up to it, there are celebrations and events almost every day, and you can easily get a programme of the different krewe parades. Visiting New Orleans for Mardi Gras has to be one of the most exciting trips there is, so get your face mask, body paint and beads ready, and follow the krewes on a journey you’ll never forget. The five days before Mardi Gras are when the real parades and celebrations take place. There are King Cake parties being held everywhere, so do make sure that you attend a few to try the traditional Mardi Gras cake. King Cake is a kind of brioche roll type cake, which is then covered in icing and decorated, normally in the trademark purple, green and gold carnival colours. There’s usually a toy or trinket in the cake, often a baby to represent the baby Jesus – Mardi Gras has its roots in French catholic traditions – and the person who finds it has lots of privileges and duties. You can now get cakes with different fillings, the Zulu Krewe cake is filled with chocolate and covered in coconut, a nod to their tradition of throwing hand painted coconuts to followers and spectators. During the five days leading up to Fat Tuesday some of the most famous krewes lead parades, culminating with Zulu Social Aid & Pleasure Club – or Zulu Krewe, and Krewe of Rex, the kings of carnival, on Mardi Gras day. Most of the main parades are on St. Charles and Canal. Only Krewe de Vieux, followed by Krewe Delusion still parade in the French Quarter’s narrow streets, not one to take the children to though, it’s filled with irreverent fun and satire, so you’ll need a broad mind and a sense of humour. See the all woman Krewe of Muses, or Krewe of Cleopatra, or follow the male Knights of Sparta, or take in the Krewe of Iris parade, which upholds Mardi Gras tradition of full masks, and try to catch one of their throws – specially minted lavender and green doubloons. Many of the krewes have Greek, Egyptian or mythical names and traditions and they all have their own histories and customs. Join in with them in New Orleans for Mardi Gras to learn a little about them and to make great lifelong friends. New Orleans is a thrilling city to visit, the home of jazz and where Evangeline waited in vain for her lover under the famous oak tree. Try beignets and cafe au lait in a French Quarter cafe, or have a po’ boy sandwich or snow cone from one of the many street vendors. Drive on the causeway bridge over Lake Pontchartrain and dine out in style with some of the best creole and cajun food that the city is famed for. Or take the music lovers trail and try one of the exclusive escorted tours of America’s Deep South, taking in Nashville, home of country music and Grand Ole Opry, and Memphis, where you can visit Elvis Presley’s Gracelands home, before heading to New Orleans. Or really see some of this exceptional region with one of the great tours of America’s Deep South like the American Music & Movie Trails self-drive tour that takes in lots of great music and movie locations throughout the south. See Birmingham, Alabama and Louisville, Kentucky, and of course spend two nights in fabulous New Orleans. Whether you’d love to visit for Mardi Gras, or whether you’d really like to get a feel for the southern states with a fantastic tour, you’re certain to experience some fabulous new things and make great new friends. Article written by David Wells.